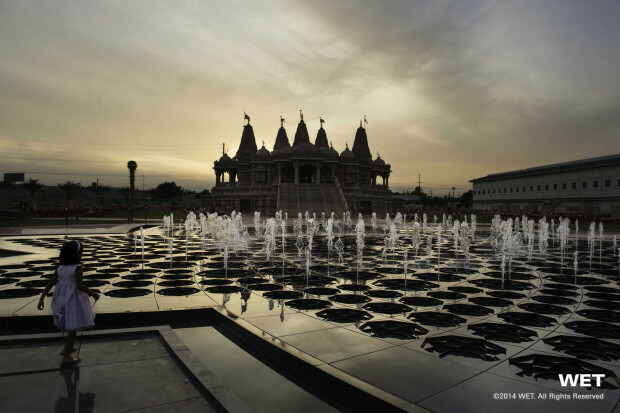 WET created an aquatic courtyard welcoming all visitors of the Chino Hills based Hindu temple and Cultural Center with its mix of playful and tranquil movement. 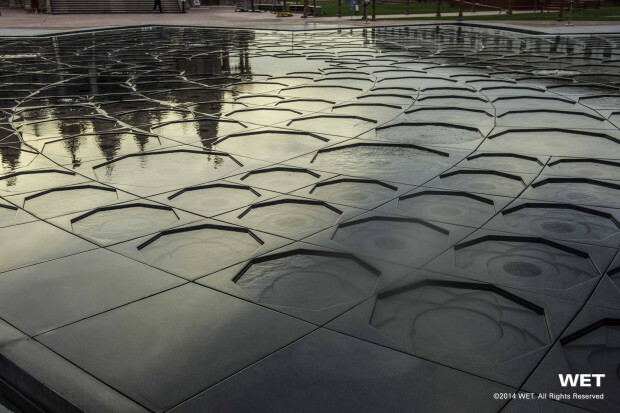 Pulsating bursts of water emerge as if out of thin air and collect upon the mosaic of granite’s assorted depths and strategic cut outs, which were designed to reveal multiple shapes and textures throughout the feature’s varied states. 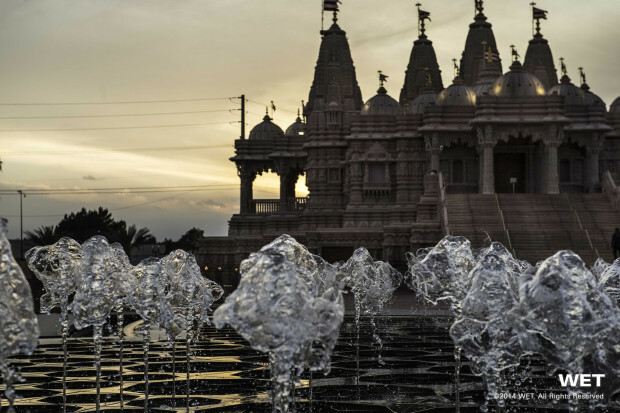 The client of BAPS Shri Swaminarayan Mandir & Cultural Center hoped for a beautifully reflective water feature to literally reflect their neighboring Hindu Temple, featuring accents true to the center’s Hindu beliefs and culture. 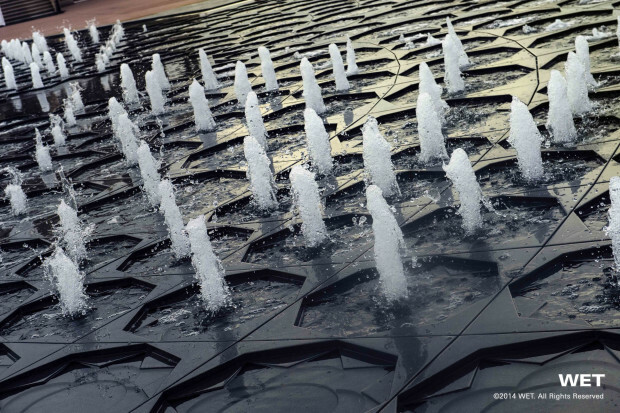 With a constraining budget, resulting in them considering smaller traditional water fountain creators, WET stepped in to accommodate the budget with it being a cultural center and a local Los Angeles destination. 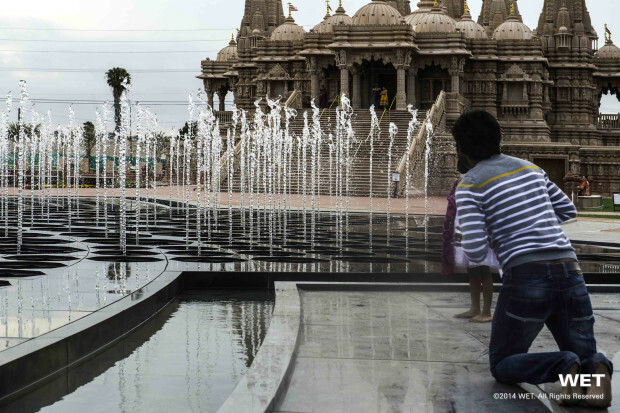 WET exceeded their goals implementing their waterskin like expression upon the lotus shaped pool, symbolic of the Hindu faith. Going beyond with the design’s multi-level, multiple mini lotuses spread about the space, which result in varying textures, shapes and reflective qualities within the choreographed centerpiece. Additionally, WET’s engineers collaboratively developed and debuted a liquid canopy emitting jet for BAPS feature. An even more economically and earth conscious device to the already “green” air-powered water jets they made famous. WET employs over two hundred talented individuals, including designers, architects, landscape architects, graphic artists, motion designers, inventors, fluid mechanics engineers, special effects technicians, electrical engineers, choreographers, optical engineers, control system engineers, animators and illustrators. Each project is a true collaboration between all of these talents. WET carries out all aspects of its projects from concept to completion. 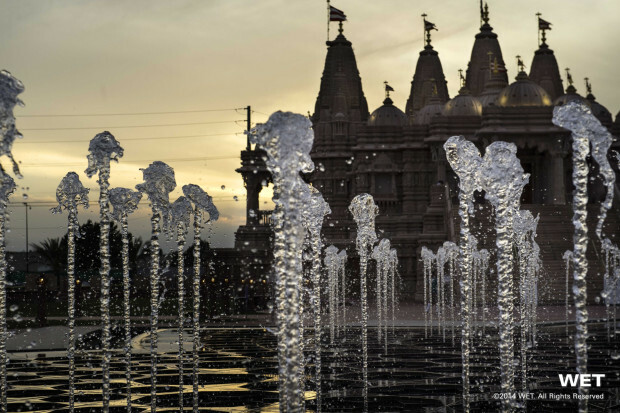 For BAPS water feature: Mark Fuller, Chief Excellence Officer, whom collaboratively spearheaded this project with Claire Kahn, Principal Designer, and the leaders (clients) of BAPS Shri Swaminarayan Mandir & Cultural Center; Maria Villamil, Chief Technology Development Officer, who contributed her expertise from concept to completion and expedited the permits pulling and the feature’s overall construction. WET accompanied the client on a trip to China to pick the physically granite used on BAPS Lotus’ grounds to insure the design’s integrity was hand in hand with the client’s need for using materials and mechanics true in line with their beliefs.